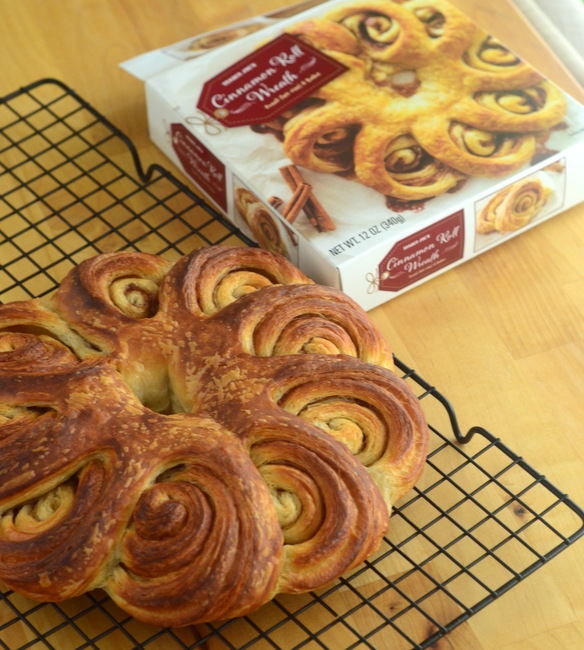 I’ve already reviewed a couple of the seasonal items that Trader Joe’s has released for the 2017 holiday season, but theÂ Trader Joe’s Cinnamon Roll Wreath just might be one of my favorites so far. The Wreath is a pastry that you’ll find in the freezer section of the store. It’s got a beautiful, swirling look to it and the instructions on the packaging say you can just let it rise and bake it for a fresh and easy morning pastry. The packaging offers a couple of options for proofing this pastry, though for both options you’ll need to unwrap it and place it on a parchment-lined baking sheet. You can let it rise in the refrigerator overnight (at least 12 hours) or on the counter for 6-8 hours. Since I don’t sleep for 12 hours a night, I actually let mine rise on the counter overnight and preheated the oven when I got up in the morning. 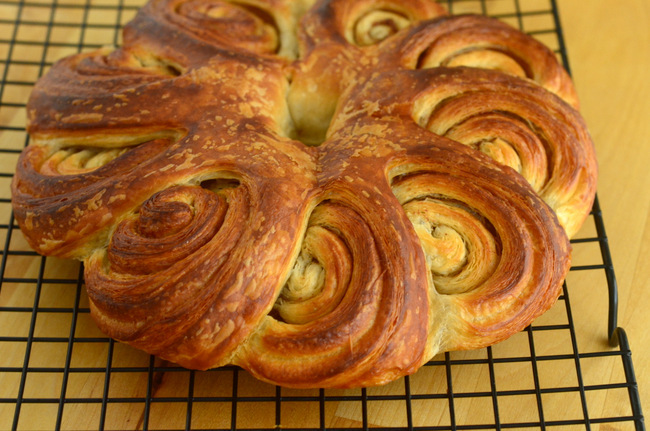 The pastry bakes up to be a stunning golden color, with beautifully defined spirals and a wonderfully buttery flavor with a hint of cinnamon. The yeasted dough is light and becomes quite crisp on the outside of the pastry, while remaining very tender inside each spiral. It’s not overly sweet and I found it very satisfying to eat as-is, but there is a recipe for a quick confectioners’ sugar glaze on the back of the package if you want to sweeten yours up. It’s delicious and I would absolutely buy this wreath again to treat myself or to serve to guests. The only slightly disappointing thing about this pastry is the size – at least, the size of the pastry when you take it out of the package. Though the box is not large, the pastry was much smaller than I expected initially. Don’t get discouraged when you see it, though! As I proofed it, it did more than double in size, which yielded a pastry that would easily serve 6 people once it was baked. You could squeeze 8 servings out of this, but only if you and your brunch guests have a lot of self control. I think one and a half swirls per person is a nice serving size here, and that is about what I got out of it. The pastry is still tasty the day after baking, but you’re going to want to eat it within a day or two for the best flavor and texture. Neat product! Is it required to let it rise? Yes, you have to allow it to rise prior to baking.